"Love Song" is American singer-songwriter Sara Bareilles' debut single, released in June 2007 via Epic Records from her major-label debut album, Little Voice (2007). It was nominated for 2009 Grammy Awards in the categories Song of the Year and Best Female Pop Vocal Performance. This folio provides a retrospective of Mr. Schwartz's wonderfully varied first 30 years of a professional songwriting career that has taken him from the stage to screen and everywhere in between. Some of his most popular works include Godspell, Pocahontas, The Hunchback of Notre Dame, and more. 41 piano/vocal/guitar arrangements, including: All Good Gifts - Butterflies Are Free - Cold Enough to Snow - Colors of the Wind - Day by Day - Extraordinary - Fathers and Sons - In Whatever Time We Have - Life Goes On - Lost in the Wilderness - Meadowlark - Proud Lady - When You Believe - and more. 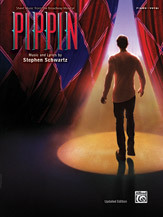 This updated, newly-engraved songbook was produced in direct consultation with Stephen Schwartz to coincide with the smash 2013 Broadway revival of Pippin. The song "On the Right Track" is now included, and the composer provided a number of lyric and arrangement updates. Titles: Magic to Do * Corner of the Sky * Simple Joys * No Time at All * With You * Spread a Little Sunshine * Morning Glow * On the Right Track * Kind of Woman * Extraordinary * Love Song * I Guess I'll Miss the Man * Pippin (Finale). 25 powerhouse hits from today's greatest divas, including Lady Gaga, Taylor Swift, Pink, Adele, Kelly Clarkson, Beyonce and more! This Nahuatl text is a lyrical, rhapsodic setting of a ravishing text. Features a Soprano Solo.